I want to go to Lake Mburo National park; Uganda! How do i get there? Lake Mburo National Park is conveniently located on the western highway between Masaka and Mbarara districts. Lake Mburo National Park covers roughly 370 square kilometers of the land. The park was first gazetted as a hunting area in 1933 and later was made a National Park in 1963. Lake Mburo National Park is an incredible little park perfect for short Uganda wildlife safaris that’s why many tourists opt to make safaris to Uganda, just to visit the historical park. The Lake Mburo National Park is a distinct place with unique wildlife like the giant eland antelopes, zebras, impala, and acacia associated birds. Lake Mburo National Park is a home to over 69 mammals common of which are, warthogs, Buffalos, Defassa waterbucks, Oribi, reed bucks and about 350 bird species. Leopards and hyenas are also present and very few lions. From Entebbe International airport, the main entry point to Uganda, to Kibuye roundabout where you connect to Kampala Masaka road is about 37.3 Kilometers. From Kampala, Lake Mburo National Park can be accessed using various routes depending on where the traveler is coming from. 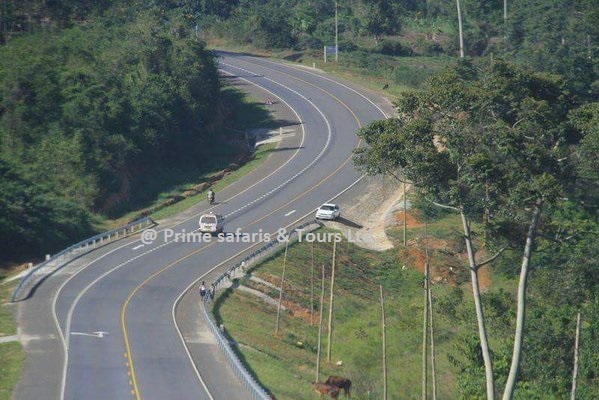 From Kibuye, using the Kampala Masaka road,Lake Mburo National Park is roughly 224km. Getting there while using this road roughly takes 4hours. While on this road, your bound to pass in the following towns; Katende-Mpigi-Kamengo- Budde-Mitala Maria-Buwama-Lukaya-Masaka-Kinoni-Bukoto- and then Lyantonde. Lake Mburo National Park has two gates that travelers use to get to the park; Nshara gate and Sanga gate. When you arrive in Lyantonde, approaching from Kampala, Nshara gate is roughly 13 kilometers past Lyantonde. Well as the Sanga junction is found in the Sanga trading Centre that is around 27 kilometers past Lyantonde district. When traveling from Kampala via Buwama-Gomba-Kabulasoke-Madu-Sembabule-Bukoto-Lyantonde, it is about 268km. Using this road roughly takes about 5hours. Alternatively from Kampala, via the Mityana road, it takes around 273km to get to the park. This roughly takes a traveler between 5-6 hours to get to the park. This road passes through towns like; Bulenga-Buloba-Bujuko-Zigoti-Mityana- Myanzi-Madu-Sembabule-Bukoto and then Lyantonde. From Mbarara town, Sanga gate is about 37 kilometers East of Mbarara while the Nshara gate is roughly 50 kilometers from Mbarara. All these places have clear sign posts leading you to Lake Mburo National Park. When coming from Kiruhura district via Kaguta road, it is about 76km and it takes about 1 and half hours to get to Lake Mburo National Park. From Kiruhura district via Mbarara Masaka road, its roughly 73km taking about 1 and a half hours to get to Lake Mburo National Park. Alternatively Kiruhura town; Rushere via Kyankoko, getting to Lake Mburo National Park is roughly 55km taking you about 1hour. By air, domestic flights can be arranged to Lake Mburo National Park nearest airport; Mbarara airport. These domestic lights are organized by air aviation companies like Aerolink and Fly Uganda. after landing at the airport, the traveler is thereafter driven to Lake Mburo National Park by car, or a boda. From Mbarara airport, it is about 58km from Mbarara to Lake Mburo National Park and this usually takes a 1 and a half hours drive. Travelers have various options to use if they choose to go by public means. 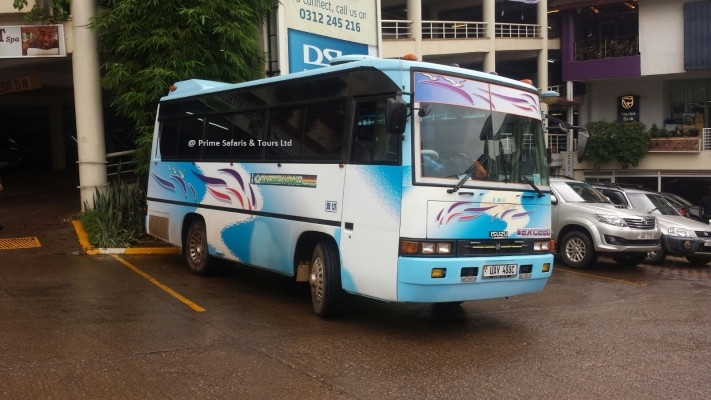 These include taxis, bodas, buses, mini buses. The main transport vehicles when using public transport in Uganda are called “Taxis”. 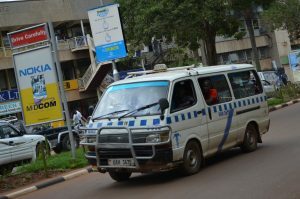 The Ugandan taxis are approved to carry 14 passengers. Countrywide, the taxis are distinguished by their blue and white markings. They are normally located in the Taxi parks. These taxis are driven on fixed routes, mainly from the city center to the given stop-offs. It is not that easy to tell which taxi goes where, so it is best always to ask. Ugandans are actually friendly and can help direct a stuck person. People always flag everywhere and anyone can get off anywhere. The payment is normally done after the journey and the amount depends on the distance. All towns in Uganda can be linked by bus. There are bus many bus parks in Uganda. in Kampala, every type of bus has a park. The bigger coaches are preferable compared to the smaller shared taxis concerning safety and comfort. There are specific buses foe each road. Tickets are booked before departure time. Departure is normally at the park as well. To travel by bus is in general cheap and comfortable. Besides the above, there are also “boda bodas”, also refered to motorbikes or bicycles. There is always a place where a traveler sits. These boda bodas are used to get to destinations off the main roads, instead of walking some kilometers from where the taxi stops. 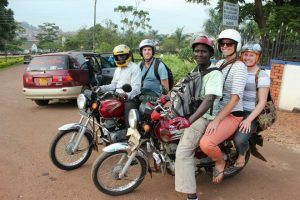 Within Kampala the main advantage of boda bodas is that you save time during rush hours. You reach your destination by boda boda quickly, while all others have to wait in the traffic jam. A “special hire” in Uganda is that, what whites call a “taxi” in their countries. This is the best and works very well because it’s very comfortable and the driver works within your time. The drivers are friendly and they try to make you feel at home. The taxi fee does not depend on the distance or the duration, its normally negotiated before the journey starts. Of course, as a traveler you always pay a little bit more than a Ugandan. Uganda has variety of car rental companies that have all types of cars, well serviced accompanied with well trained and qualified drivers. They offer self drive car hire rentals to tourists and other people in the country. 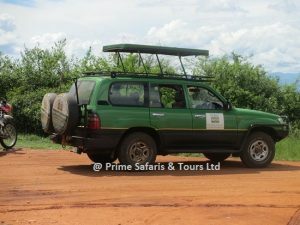 These cars include safaris 4×4 cars, like land cruisers, minibuses, Rav4s, Land cruisers among others. Most National Parks are located in the remote areas of the country. This is so because they have remained natural places, intact and untouched. They are located so many kilometers from the public roads. Unless a traveler makes arrangements with the lodge where you will be sleeping, the cost of inconveniences will be more expensive. Travels may also make their way to the park and be disturbed if they had not earlier planned with them. The best way to have a successful Uganda safari is by organizing your safari Uganda with Prime safaris as you tour operator so as to have a planned and interesting Uganda wildlife safari to Lake Mburo National Park.